Retired fire fighter Jim Templeton died on 27 November last year. His name will mean little to all but the more ardent students of Forteana and UFOlogy. 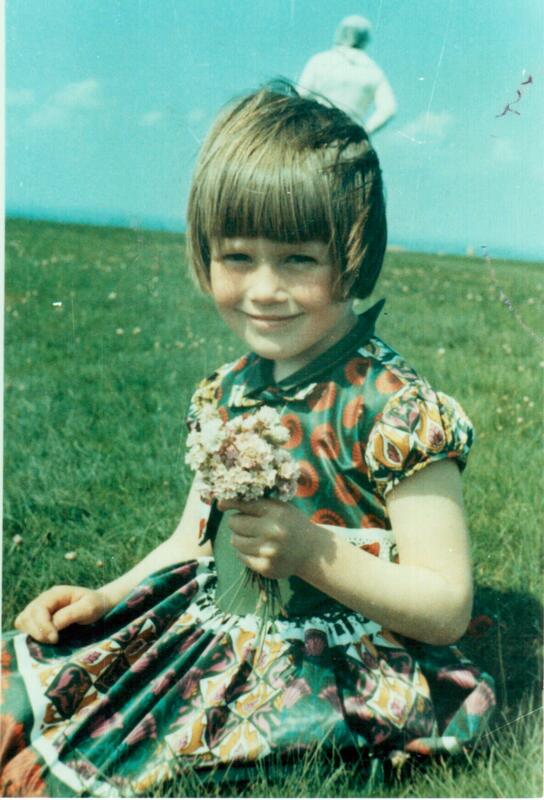 But the ‘freak’ photograph he took in May 1964 on the Solway Marshes, in Cumbria, has been reproduced across the world in numerous TV programmes, books and magazines during the past half century. The photo depicts a strange white-suited ‘spaceman’ standing, or floating, at an odd angle behind his five-year-old daughter Elizabeth, who is posing with a bunch of flowers in the foreground. It was taken using an SLR camera loaded with Kodacolor film which was processed by Kodak. Despite numerous attempts to explain the photograph it continues to remain one of the most puzzling anomalous images ever taken. It was, apparently, examined by the CID branch at Carlisle police station and by RAF experts at the Air Ministry. But new facts have recently come to light that put a new twist on Jim’s story about a subsequent visit from two mysterious ‘Men In Black’ who he believed had been sent by the British government. Read the full story of the Solway Spaceman mystery in a new Case Files page here, co-authored with Andy Roberts, that first appeared in the April 2012 edition of Fortean Times. This entry was posted in Uncategorized and tagged Andy Roberts, Cumberland spaceman, Fortean Times, Jim Templeton, Men in Black, Solway Marshes, Solway spaceman. Bookmark the permalink. 8 Responses to Farewell to the Solway Spaceman? I’ve always thought this is just a picture of a bloke in a white hooded sweatshirt and a white cap facing away from the camera. You can see the hood, and if he’s that way round it makes sense of that strange arm posture. The angle of the girl’s head makes him look weirdly out of place. The photographer must have seen him at the time, mind you. always interesting once someone dies that the “truth” comes out. I wonder what will happen once Gordon Faulkner and Roger Hooten pass away regarding the infamous “Warminster” photo. This image, which has become almost iconic still ignites debate to this day. We live in intersting times! Well, we *all* think it’s a fake, Paul and if the photograhs surfaced today it would be laughed out of the newspapers and even the farthest fringe of the farthest frings of ufology would probably disown it. But, set against the doldrums of UK ufology which is the time period in which it was taken, it was *huge* news and really was the start of the 60s UFO boom that led to Warminster and beyond. And for it to *be* a fake it has to be proved to be so- and despite several professionaly analyses, it resists such a resolution. It’s an inconic photo from a naive age, a time when the contactee-ism of 50s ufology finally gave way to the next wave. Personally, I think it’s a model of the kind found in cereal packets as I distinctly remember something very much like it from the time. I’d like to question the idea that, outside the newspapers of the time, the story surrounding this photograph appeared in many UFO books. I’m aware that it made an appearance in Flying Saucer Review in 1964 but what about UFO books of the late 60s and early 70s? In my own collection I have found some references in 80s/90s books but I don’t have any from the 70s. Can you offer some suggestions please? Hi Tony, I think the main exposure the photo received was in the output of Jenny Randles; I suspect, without checking, the photo was referred to in a number of her books, most importantly in ‘Men in Black’ (1997), which followed the BBC2 programme ‘Tales of the Paranormal’ (1996) where Templeton was interview. I think the phot also appears in Bob Rickard’s Fortean Times book on anomalous photographs that appeared, I believe, in the late 70s.